By Angie Drobnic Holan on Tuesday, May 12th, 2015 at 9:27 a.m. The Rouhani Meter tracks 73 campaign promises. Tracking the campaign promises of elected officials is spreading internationally. 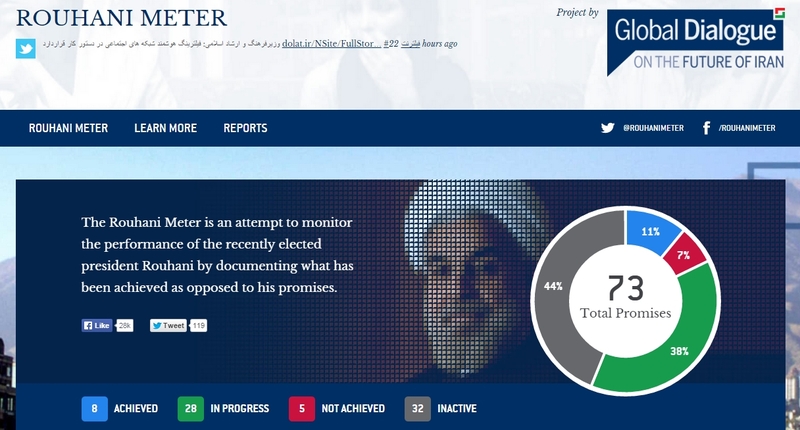 One of the more recent additions to the movement is the Rouhani Meter, which tracks the campaign promises of President Hassan Rouhani of Iran. The Rouhani Meter works in similar fashion to PolitiFact’s Obameter, which monitors more than 500 of President Barack Obama’s campaign promises. But because Iran doesn’t have freedom of the press, promise trackers are keeping tabs on Rouhani from Canada in a unique collaboration between a major university, computer programmers and civic activists. The Rouhani Meter is tracking 73 promises that Rouhani made during the campaign of 2013; its ratings are "in progress," "inactive," "achieved" and "not achieved." Among the most notable promises was to look into ending house arrest of the Green Movement leaders, the people who led demonstrations in 2009 for democratic reforms. The promise is rated "inactive," meaning there is no discernable action being made on the promise. Other promises include reducing and lifting sanctions, currently rated "in progress," and lowering the inflation rate to below 25 percent, currently rated "achieved." Ali Bangi, ASL19’s director, said the Rouhani Meter was inspired by the Morsi Meter, a 2012 project to monitor campaign promises made by Egyptian President Mohamed Morsi. (The Morsi Meter was inspired by PolitiFact’s Obameter.) The goal is to present information succinctly in a way that’s also visually compelling. Bangi said the site is intended for people in Iran, many of whom have to use specialized technology tools to circumvent Internet censors. "I think it came out at the right time and it got very good, positive feedback right away," Bangi said. In fact, when the Rouhani Meter first appeared, some people thought it was a site created by the government -- until the government blocked the site. "Then Iranians noticed the website was blocked and had to use circumvention tools (to access it), and then it was clear this was not the government," Bangi said. In fact, the project grew out of the University of Toronto’s interest in circumvention technology, said Sean Willett, creative director for Digital Public Square. For example, Psiphon -- open source software that lets people connect to the Internet even when censorship controls are in place -- began as a project of the university’s Citizen Lab. The university’s other goal for the project is expanding crowdsourcing, to get people in Iran involved by asking them to reach out and let the Rouhani Meter know when action has been taken on a promise. "Great research, crowdsourcing, and support tools like Psiphon mean the site has had very good traffic and a strong online community," Willett said. The site has connected with over 3 million users from inside the country, despite being blocked by the Iranian government. The site prides itself on its neutral language and commitment to providing well-sourced information, while at the same time being open to new sources. "I don't think the Rouhani Meter ever intends to be the final verdict," Willett said. "Instead it says, here is the information we have, and we’re trying to involve the community in getting even better information." In March, the Rouhani Meter hosted a gathering of international promise trackers at a meeting in Valencia, Spain. Those in attendance included promise trackers with PolitiFact, France’s Lui President and Egypt’s Morsi Meter.